Among the features characterizing majority of the hard loft conversions - great ceiling heigts, large, factory-style windows, original floor finishes (either old wood or concrete), exposed brick walls and exposed ducts and pipes, concrete floors are very often at the top of the wish list of my clients. 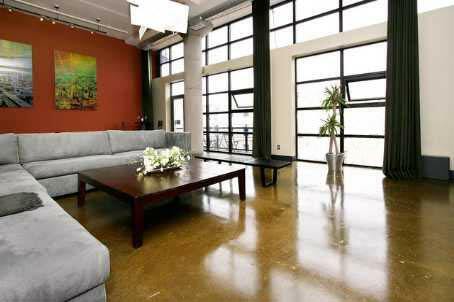 Concrete floors are durable, easy to clean and attractive. They appeal to the senses. They look just as well with sparse, modern furnishing as with antiques. But to look their best, concrete floors should be finished by aplying a decorative cement surface which is then polished. Before polishing, the surface can be stained. While it is impossible for an owner of a single loft unit to change windows, or increase ceiling heights, it is possible to have new 'finished' (but not polished), or old and tired floors re-surfaced and polished. While not inexpensive, such treatment, combined with modern furnishings, adds a 'lofty' look even to a typical condo apartment. When looking for a durable, unique and beautiful finish for your concrete floors, the most attractive option is to have them stained. It is important to use an experienced professional - once these floors are finished, they will last a very long time, so the expense is well justified. If one desires more unusual and unique treatment for the concrete floor, concrete engravings and patterns can be used to create borders, inlayed logos, interesting entrances or grout lines. When deciding on a colour for the acid stain, it is important to be aware of the fact that the result will often be different that the colour of the stain. Many tan or amber colours end up light green. It takes approximately 8 hour for the reaction to take place, and natural variations, as well as imperfections of the surface, will become evident after staining. If there are undesirable blemishes or imperfections in the floor surface, they should be addressed before applying the stain. But imperfections highlight the character and uniqueness of this finish - no two floor surfaces will end being identical. Other than acid stains, which require a chemical reaction to create the colour, dyes or tints can be used on dry, cured concrete to add a shade or colour to the floor surface. These can be sprayed onto the floor, or spread using mops, sponges or rags. These products are available in various shades and can be applied to create various finishes. Once your concrete floor is stained, it will need to be finished, to maintain its attractive looks. Sealers or waxes can be applied - these finishes need to be re-applied periodically. Ultimately, concrete floor can be polished, using diamond polishers. Polished concrete floors require no maintenance other than vacuuming or occasional washing to remove dust, dirt or any spills. Concrete Your Way Inc., 1054 Centre St., Toronto, ON, 416.564.9754, Concrete Your Way - highly recommended by one of our clients. "They did a phenomenal job", and the recommended contact is Roman. Concrete Art-FX, Rick Katz, 5 - 207 Edgeley Blvd., Concord, ON L4K 4B5, 416.907.4260, ConcreteArt. FloorLab, 22 Hugo Ave., Toronto, ON M6P 3T4, 647.868.7625, FloorLab. TTM Finishes Inc., Marco Chiesa, 7777 Keele St. Unit 8, Concord, ON L4K 1Y7, 416.768.7800 or 905.850.0335, TTM Finishes. CCSI Marble Care & Decorative Concrete, Mike Radowsky, Niagara Falls, Ontario, 905.354.5720 or 1.888.263.1476, CCSI. Concrete Evidence, Toronto, 416.898.1193, Concrete Evidence. StoneLinc, Antony Lenkes or Maureen O'Dea, 103 Denison St., Markham, ON L3R 1B5, 905.475.5640, StoneLinc. If you use one of the above listed contractors, or someone else, we would be extremely grateful for your comments. Please write us, even very briefly, to our e-mail address.